Welcome to my Halloween Party. Do come in we have been waiting for you. 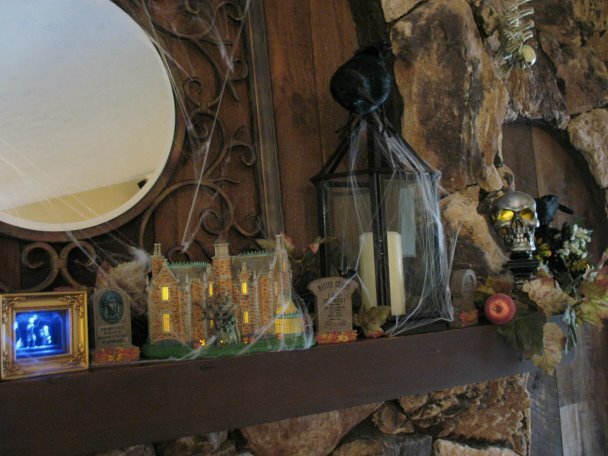 Our house has been decorated and we have gotten everything in order for this frightening event…. 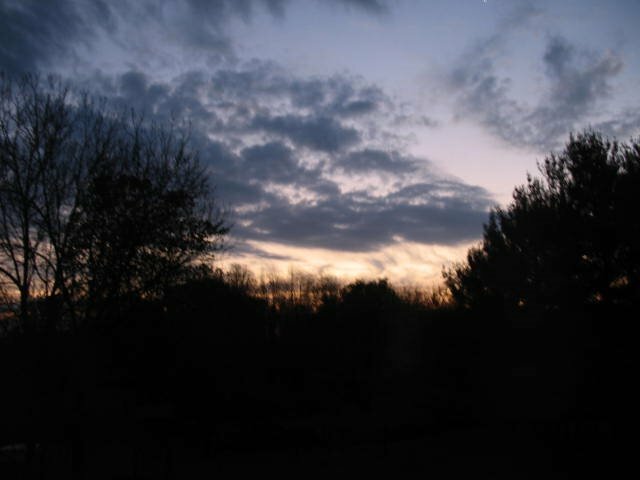 The day began with this eerie looking morning sky. Maybe it was a little foreboding of the day to come. Witches, ghouls and ghosts are about, hopefully the party will go off without them being brought out…. Come into the living room and sit for a spell while we await the others…. Have a closer look at the curiosities found in here. The living room is being guarded by our curious friend. 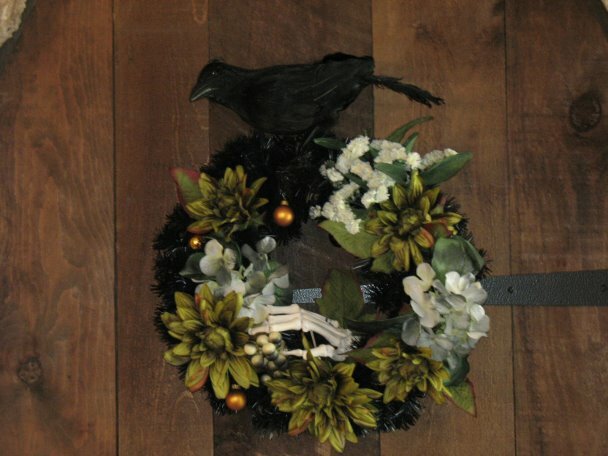 Those are a couple of the items I have made to celebrate the Holiday. 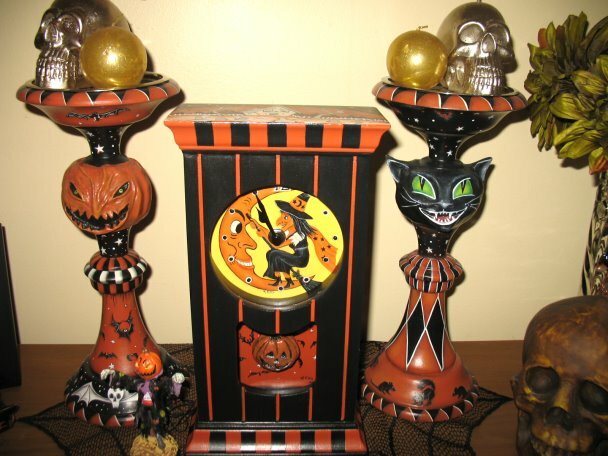 The candlesticks were sculpted and painted by me and also the clock is a new addition that I just completed. If you would like a closer look at those items please check out our Etsy store and Ebay Listings. It appears that we are ready for some refreshments…. Help yourself to a cupcake…. Or how about a chocolate sandwich cookie? 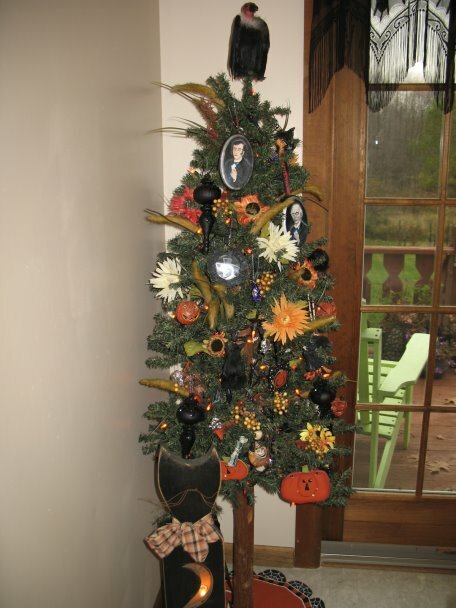 My Halloween tree has some new ornaments added this year and few feathered foul have taken roost in it…. One new addition to the the tree is this ornament I painted. 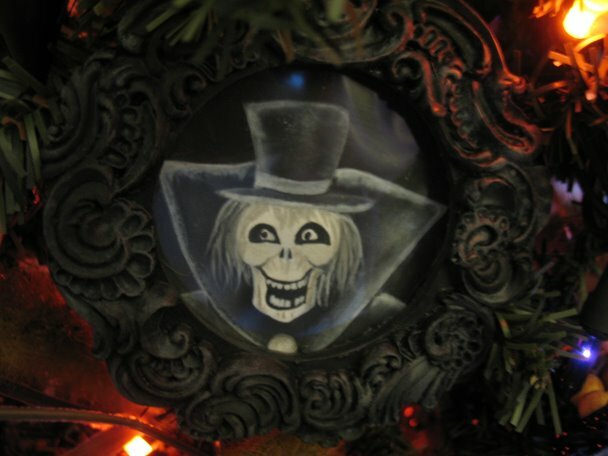 It is my version of the Hatbox Ghost from The Haunted Mansion. If you would like the chance to win this ornament leave me a comment and I will randomly draw a winner on Friday, November 2nd. Make sure to leave me a way to contact (email address or a link to your blog) you if you win. 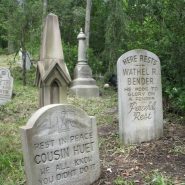 I feel the spirits getting restless…..I think it is time for me to say farewell and be off to visit all the other wonderful Halloween Blog Parties. I would like to take a moment to thank Vanessa for hosting the party again. Her parties are always the best and most fun! Happy Halloween and Hurry Back! Oooh what a magical Halloween party! 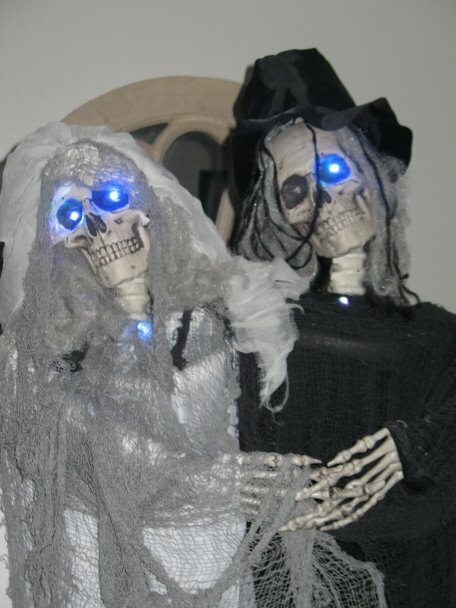 I love the skeleton couple, spooky spooky! 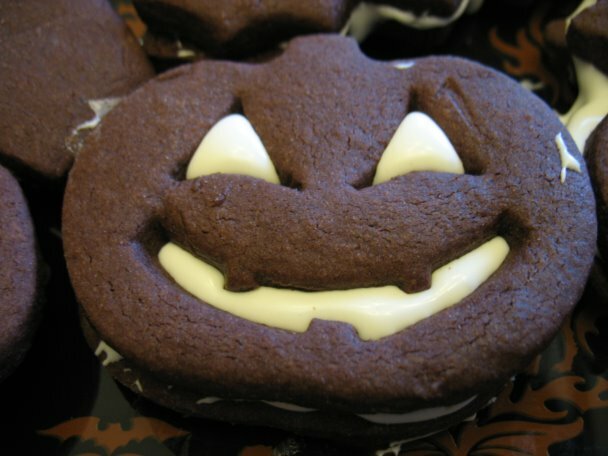 And hope you don’t mind I’m helping myself to one of those scary chocolate sandwich cookies… delicious! 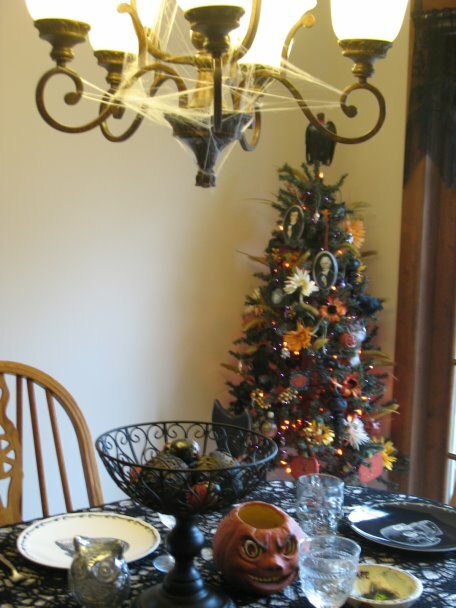 I have a spooky tree that ornie would be perfect for. Thanks for the party! 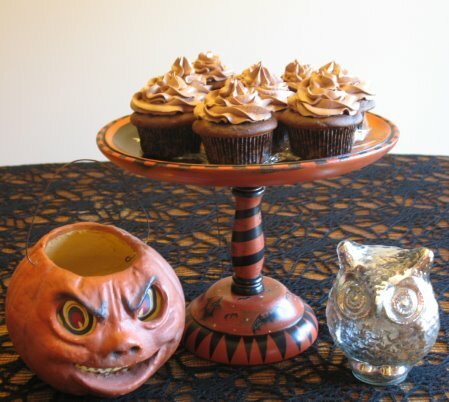 Great post, and those chocolate spooky treats look amazing!! Wow, that fireplace wall is simply something else! Fabulous party! Your party was wonderful and York treats were divine. 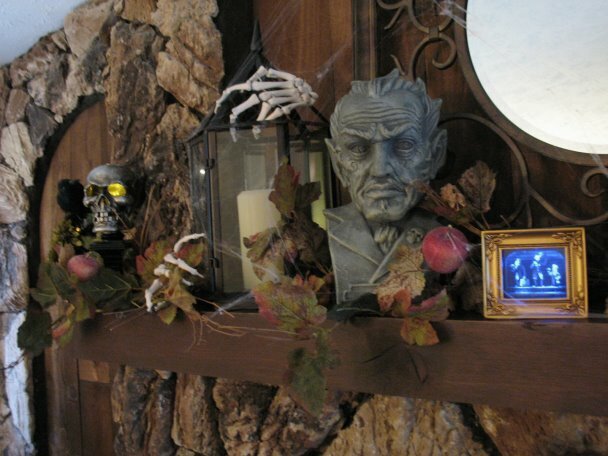 The bust on your mantlepiece is gorgeous. You have a lovely home. Thank you for showing us around. Spooky and sooo much fun. I love your Halloween tree! 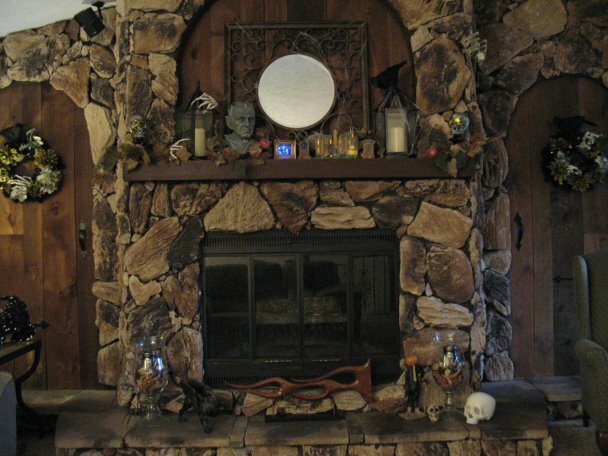 Oooo, you have the perfect fireplace for Halloween decorating! I love your painted creations….you are very talented, indeed! 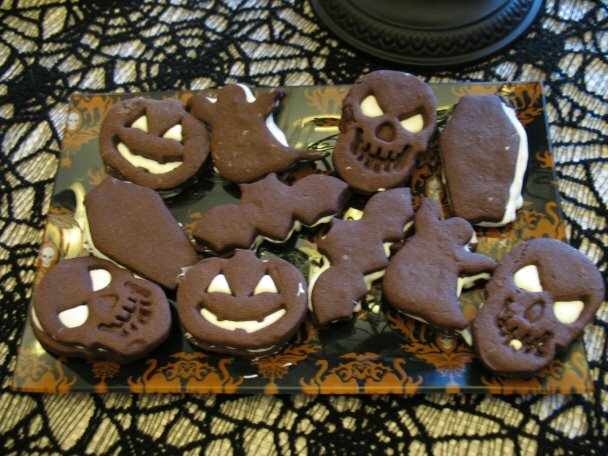 Thanks so much for the invite…..and jack-o-lantern cookie! Oh my!!! I think I just fainted at the sight of that fireplace! And that Halloween tree, and your treasures and cupcakes too! Perfectly Halloween, pefectly wonderful you are you are!! Oh the fireplace, the collectibles, the chocolate COOKIES with white icing centers…….! I want one straight away! What a blast, thanks so much for creating this beautiful spread-happy halloween! 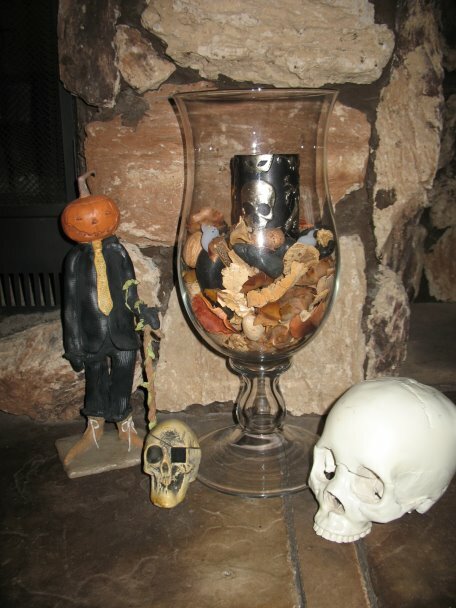 I have Halloween trinket envy – I want I want! And that Halloween tree OMG! What a FABULOUS idea! I also so in love with your Halloween man! Please enter me for a chance to win that wonderful ornie! I have a Halloween tree that I keep up year round and I LOVE the Haunted mansion at Disney. He would have a great home here. Wonderful!! Love your tree and candlesticks…heck, everything is fabulous! First off let me say I love that stone fireplace. How charming. Everything looked amazing at the party, and your paintings are delightful. The cookies were scrumptious and I want some more. ohhhhh pleeeeease. What a fabulous party!! The chocolate cookies look delicious. And I love your Halloween tree. Thanks for the visit and invitation!! Well, well, well…no surprise that this looks so neat. You and your husband are so talented. I think I should win the ornament because…oh I don’t know…just wanted to let you know how impressed I am! Oh i just love your Halloween decor! 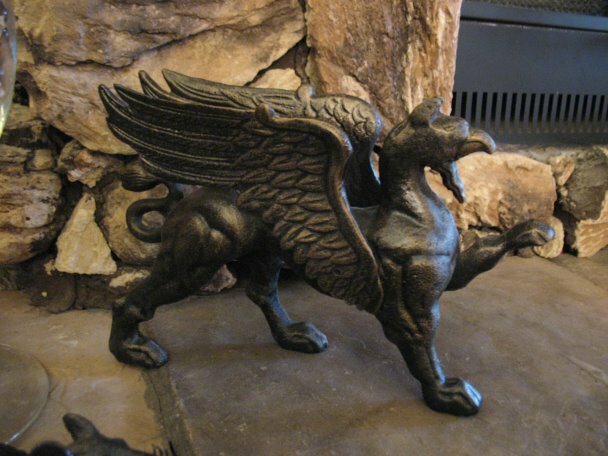 Your fireplace looks incredible. And yes, what a spooky, eerie morning indeed! 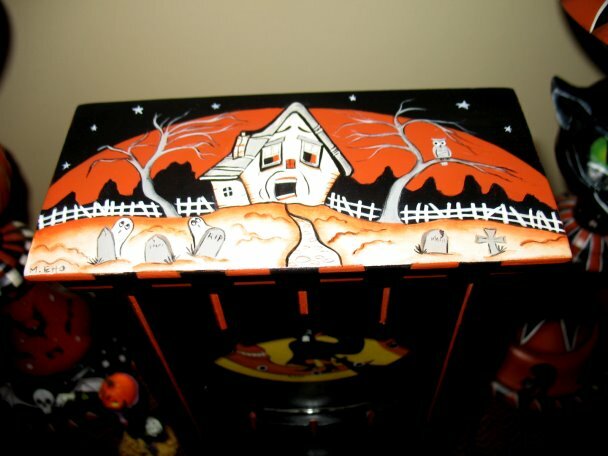 Tons of neat Halloween decor! Popped in from the Halloween Party 2012. LOVELY post and awesome creations! come meet my Coven, if you haven’t already. Thanks to Sandy…I am still making the rounds..I live in the dead center of landfall…we got hit hard, and my hubs is in the hospital also…was CCU, no Telemetry.